American Sniper will likely be the most controversial and divisive movie of 2015, and it's mid-January. From concerns over the baldly anti-Muslim social-media rants it has inspired to titular real-life protagonist Chris Kyle's debatable status as a hero to his notorious unreliability as a non-fiction narrator to the confusing use of a robot doll rather than a human baby, the film has inspired both harsh criticism and lavish praise. It has also smashed box-office records, largely thanks to the conservative-leaning South and Midwest. You either love this movie or you hate it, and by extension director Clint Eastwood, star Bradley Cooper, and especially Kyle himself; there isn't much room for dialogue between the two positions. This reflects a truth that the movie itself seeks to avoid: War is political, and a movie about war is bound to make political pronouncements. When you sit down to enjoy American Sniper, you are committing a political act, and your evaluation of the movie, and Kyle as a person, reflects your political attitudes. But it's more complicated than the simple equation that progressives dislike it and conservatives enjoy it. Politics notwithstanding, those who've seen it tend to describe the experience in religious terms: awe-struck congregations of Americans seeing the Iraq War the way it happened, traveling down the path to PTSD together. Ask around: Be it Texas or Williamsburg, it's not uncommon to hear of packed theaters with the patrons filing out in reverent silence after the closing credits. Very little actually happens in American Sniper. The spiritual and emotional progress of the characters is limited to basic states of existence (good or bad, alive or dead), and none of them evolve despite numerous encounters with tragedy and misfortune. By the end of the movie, Kyle, his buddies, and their enemies alike are all making the same kinds of choices they were making in the beginning. Even Kyle, who regarded himself as a sheepdog guarding sheep against wolves—in the film, strangely, the sheep are either American citizens or Marines, or both—never sways from that belief. There is little potential reflected or implied in the characters, and no surprises. Shocks, yes—explosions, yes—but plot twists, edification, some hint at the sublime behind the everyday quotidian … no. Kyle spends his time overseas trying to kill bad guys, and his time at home trying to bone his wife (mostly the former). Despite a wealth of action, and opportunities to expand or grow, the only thing that changes over time is that the man onscreen begins to express remorse over some of the women and children he killed; he maintains the necessity of killing terrorists that, to his mind, are a direct threat to America, but once back home, he finds it necessary to do something, anything, to heal himself and others like him. Late in the film, this leads to his generously sharing his time and energy with other combat veterans suffering from the grievous injuries they sustained in combat; this seems like progress, and is satisfying to watch and feel. But the remorse, at least, may be largely fictional. If the real-life Chris Kyle—or, at least, the Chris Kyle who wrote American Sniper, the best-selling 2012 memoir—is to believed, he ended up rejecting any real responsibility for his choices. In the Western literary tradition (part of our American cultural heritage), heroes are defined in part by the epiphanies they experience. Kyle learns nothing he didn't already know about war and life during his time onscreen, and that makes him something else. But what? The movie is unwilling to hazard a guess, although the answer may lie in the title. Kyle embraces his role as a Navy SEAL sniper, which is central to both the plot and his identity. It's interesting that the literary and cinematic history of snipers goes unaddressed in the film; up until the 1990s or so, it's difficult to find them mentioned in valorous or positive terms. (America's first unequivocal sniper heroes were Randy Shughart and Gary Gordon, the Delta duo who insisted on landing amid hundreds of hostile Somalis during the Battle of Mogadishu, sacrificing themselves to save a wounded comrade during the events portrayed in both the book and the film Black Hawk Down). For much of human history, a person who stayed back from combat and killed the enemy from afar was seen as unscrupulous at best. The original sniper is Paris, who dastardly kills the Greek hero Achilles from long range with a bow and arrow; Michael Moore, always a lightening rod for progressives and conservatives alike, stated the case more strongly in a tweet this past weekend suggesting that snipers were cowards. The movie is careful to demonstrate that Kyle had no problem clearing houses of bad guys, that he was happy to mix it up at close range and often actively put himself in danger. But his archenemy in the film, a devious Syrian sniper working with the insurgents, is accorded no such respect, and aside from a brief scene with (presumably) his own wife and child, is barely humanized. But paradoxically, he's nonetheless more at home in this fairly simplistic movie than Kyle himself, building upon a long legacy of Hollywood sniper-villains. The evil Vietnamese character in Full Metal Jacket? A sniper. The killer of the protagonist in All's Quiet on the Western Front? A sniper. The danger lurking in almost every WWII movie out there, from Saving Private Ryan to Fury? Nazi snipers. What happened to villains like Hector—the Trojan who killed Patroclus? One of the most powerful moments in Homer occurs when Hector, the bad guy, takes leave of his wife and baby on his way to fight Achilles. Greeks, relatively primitive when it came to almost every conceivable measure of analysis, seem to have been more capable of seeing sophistication in their enemies than the type of American who cannot stand any villain with more than one dimension. It's a shame, because complicated villains open up the possibility for complicated plots. Complicated heroes do, too. But which Chris Kyle are we watching onscreen? 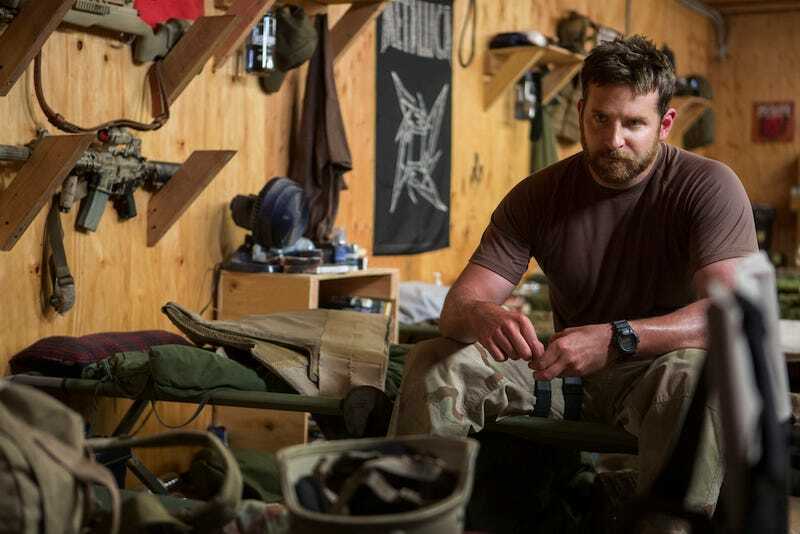 The real-life person who is proud of his identity as a sniper, and his actions in that position—the flawed but valorous character Bradley Cooper so admires, and portrays so admirably? The mythic and perfect hero that people (primarily in the South and Midwest) now believe existed? The memory of a simple, flawed husband and father, tragically murdered by a troubled veteran in some ways just like himself? The film is an uneasy composite of the many Chris Kyles people have encountered and argued about over the years. It's necessary to point this out, because the movie is inspiring a great deal of emotion, which seems based on an assumption that what's onscreen is "real" or "true," and what is being consumed is a portrait of authentic heroism. Cooper has stated in interviews that one major source of inspiration for American Sniper was the Western. Older generations familiar with the genre recall its reliance on a basic plot: Good gunslingers representing law, order, and mercy are outnumbered by bad gunslingers representing the opposite. The good guys then win through the judicious and socially sanctioned application of violence, aka "The Showdown." But while the movie version of Kyle encounters and defeats plenty of enemies who, for the sake of argument, we'll say pose a direct threat to America and Americans, one doesn't get the same sense of urgency or necessity that one would in a Western. The calculus changes when the good gunslinger has all the strength, all the numbers and power. Would we watch Tombstone if Wyatt Earp and his posse were at the O.K. Corral with a thousand Marines, two Cobra helicopter gunships, and a sniper team to pit against the Cowboys? Wouldn't Eastwood's own Unforgiven be less compelling if William Munny rode into town for vengeance at the head of a convoy of tanks and soldiers, jets screaming overhead? What's heroic or courageous in one situation becomes absurd in another, all the more in this case because the absurdity is buried under what every American viewer already knows about American Sniper's larger story: Within a few years of our departure, ISIS emerged from Syria and took over the battlegrounds in which Kyle and other Americans fought. To put it bluntly, Kyle's actions had no impact whatsoever toward bringing peace or stability to Iraq. I'm still waiting for a good war movie to describe Iraq or Afghanistan. It seems like the literary and cinematic trend now is to capture realistic and factually probable events from war, and to deliver those images to the American public without judgment or politics (as though a frank discussion of war could avoid politics). Restrepo, a 2010 documentary detailing the deployment of Army paratroopers to Afghanistan, is the finest project to emerge thus far, but documentary is designed to deliver fact, to present reality. We need a fictional movie with a plot, with a narrative, that isn't afraid to acknowledge certain truths about war: namely, that there are no heroes. There are no good guys. Killing doesn't lead to epiphany or to personal truth, save as a horrified revelation of human guilt. The people who thrive at war accept some of war's hatred inside them. This does not make American soldiers or the Muslim fighters we call terrorists heroes or monsters—it makes them human. So I was ultimately not impressed by American Sniper, but I'm clearly in the minority. And ultimately, it's far more important to me and other veterans of Iraq and Afghanistan that our fellow citizens sit down and witness the emotional reality of war, that we as a nation honestly confront our ongoing actions overseas. This awareness is urgently needed, much more so than any selfish personal desire for entertainment or enlightenment. If this film inspires conversations about cultural imperialism—and how simplistic and reductive philosophy, combined with exposure to violence and moral injury, can twist and distort a decent human being—so be it. Everyone should see this movie. But you shouldn't necessarily believe it. Adrian Bonenberger deployed twice to Afghanistan as an infantry officer, and feels sad that America doesn't use its extraordinary wealth and strength to do more good overseas. He's descended from the Mayflower colonists and has relatives in every declared war going back to the Revolution. He's written the memoir Afghan Post, co-edits the blog The Wrath Bearing Tree, and is a volunteer for the veteran-writer group Words After War. He's on Twitter @AHBonenberger.